Here is a postcard from 1910. On the front is a photograph of the "Second Ward School" in Lapeer, Michigan. I purchased the card from a local antique store. In front of the building are dozens of elementary to middle school aged children dancing and playing. 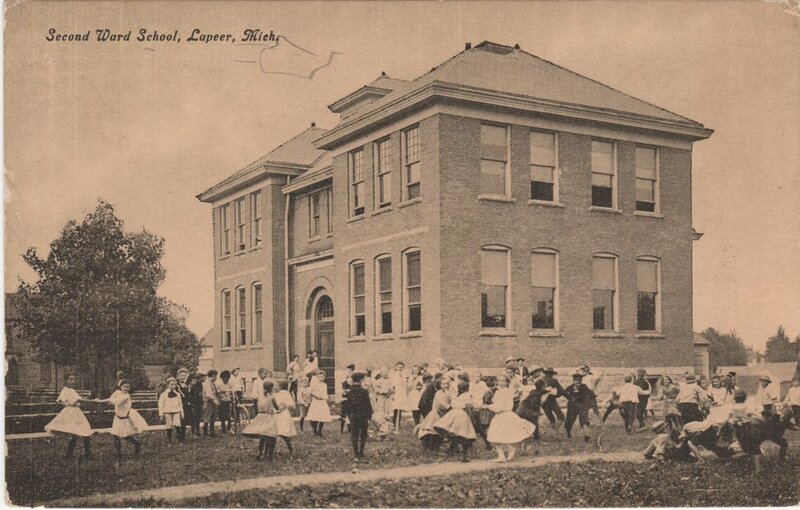 The postcard was sent on February 23, 1910 from Lapeer to Rose City, MI. Papa and mama arrived here all O.K. and left for Penn on the mid night train. Don't look for them home until Mon. night. See if you can find Howard on this Picture. The writing suggests that Raymond is writing to a sibling, Ceyril. He is letting him know that their parents arrived safely in Lapeer from Rose City. By modern travel standards, Lapeer is about a two hour drive Southeast of Rose City. February 23, 1910 was a Wednesday. "Papa and Mama" appeared to be en route to Pennsylvania and weren't expected back in Rose City until Monday, February 28, 1910. More likely, perhaps, is that their final destination was in Pennsylvania and that that is where they would remain. The photo on the postcard appears to be the same exact one found in Images of America: The Lapeer Area by Catherine Ulrich Brakefield, published in 2006. Built in 1898, the building survived about 70 years. The land now serves as a parking lot for a local funeral home. For about 15 minutes I explored the ancestry.com collections and I found several promising leads. There are many documents for "Kreibles" in Pennsylvania around this time. Perhaps this was a family with original roots in PA and Papa and Mama were visiting family in Michigan. With some extra time I might be able to learn some more. But, how about YOU give it a go! Is the recipients name "Ceyril"? Who was Raymond, and was his last name Kreible, the same as Ceryil's? Who is Howard and was he really in that photo or was Raymond making a joke? What were Papa and Mama's names? How long were typical train trips, say from Michigan to Pennsylvania, in 1910? What was Raymond doing in Lapeer? Why was Ceyril in Rose City? What do you think, feel, and wonder about as you look at the postcard and read the few details?